SuperMiata race presented by Maxxis - BRP Sept 21-22, 2013 - TrackHQ.com, the Web's leading forum for track day enthusiasts, racers and time attack drivers. 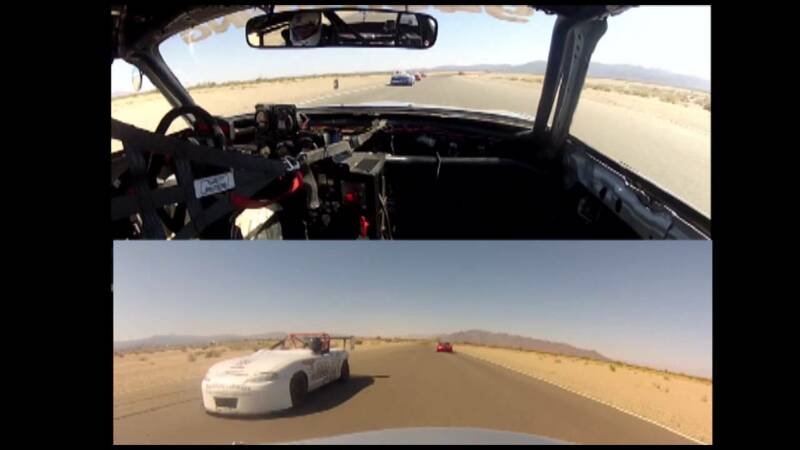 The next race in the 2013 SuperMiata trophy dash race series is next weekend at Buttonwillow Raceway. For the remainder of the 2013 series trophy dashes, any and all Miatas 90-13 are welcome to race with us. All cars must have industry standard wheel to wheel safety equipment. A current tech sticker from SCCA, NASA, VARA, AROSC, NCRC will do. We'll do our best to equalize cars by grid position. - Lowest cost production racing on the west coast! Beginning with the first race of the 2014 Championship series we will have separate start waves for cars built to SuperMiata specification and all other Miatas. Last edited by emilio700; 09-17-2013, 06:00 PM. how did it go? any problems? standing or rolling start? how'd everyone like the new tires? Anyone get run off the straight? Yeah, what happened out there this weekend? Must have had enough cars for a fun race. Just got home. We all had an absolute blast. One 30 minutes rolling start race Saturday. I qualified on pole. Got a really bad start and was P3 exiting Sunset (13CCW). Couldn't get past Moti for P2 so I just hounded him until he bobbled in Cotton Corners and I got by. Scooted up to Alex driving Enzo and again't couldn't get by. I was cooking my tires a bit so I settled down and stopped poking my nose here and there. Alex was defending and working his tires so I waited and hoped for the mistake. With about 3 to go he overshot Offramp and I tucked inside. Stayed away for the win. Sunday we inverted the grid for the first 15 minute race. Grant didn't race Saturday so he started last, I started just ahead of him. Got a good start and worked my way up to P2 Behind Aaron Bittermen at the finish. Then we did something kinda crazy (and way fun). On cool down lap we passed pit entrance and stopped at edge of track in finishing order. The last car (Grant) went past and rolled up the front straight to take his spot for the F1 style staggered grid for a standing start. Each driver went over the next so we started the 2nd race inverted from the one we just finished. So Aaron last, me again second to last. At the green Moti (P2) and I got the best starts. All kinds of wheelspin, banging 2nd gear at about 10mph with wheels still spinning. Awesome. Moti opened his visor to yell at Grant to skooch for ward while we were lining up. So when he snapped it shut, it fogged partially. That brief bit of partially obscured his vision going into Sunrise (T1) so he ran wide and had to lift while tracking out. That made everyone behind him check up. I just happened to be in the right spot and was the only guy that didn't have to lift. So I was P2 going into the esses on the first lap behind Alex. Chased Alex down, again couldn't get by so I waited for a mistake. He bobbled Bus Stop on lap 2 and I was able to get by for the win. Great battles all through the field. Had a terrible start of the day on Saturday with my battery deciding it's not going to charge anymore, which ended up costing me the entire 2nd session of the morning, normally the fastest one for the Miata Challenge. Managed a time at the next session that was good enough for third place in the MC behind Alex that won Super Mod and received a $100 Blackbird Fabworx gift certificate for doing just that (congrats!) and Emilio that finished second. That also ended up being that my grid position for the 30 minute race that came up next. Got a rocket start and zoomed by Emilio and Alex to take Sunrise first and proceeded to lead the race for the next 3 laps or so. Couldn't keep Alex behind me and had him passing me going into Riverside and than worked really hard to keep Emilio behind for the next 2 laps. Got a little sideways going into Cotton corners, Emilio thought I was ready to chuck it off the track so he stuck his nose in but I managed to save it, giving Emilio a grade 8 "oh $hit" moment as he stood on the brakes, this ended in a little tap between his RF corner and my LR wheel, re-aligning the toe. He kept behind me until we got the Buttonhook and then my new alignment presented itself in a wonderful spin. E got past and we had enough gap from the next group that I was still third, though not for long. While the car really wanted to turn left now it did not want to turn right, so right after I spun it in Buttonhook I drove it off at Sunrise into the front straight.. Ended up Letting William, Sonny and Ed past me, dropping to P6. Realizing the car is not the same now after having some seriously exciting 30 seconds, I took the next 2 laps easy to re-learn the car and went back to work. Drove like a madman for the next few laps to catch up with Ed and Sonny, got by Ed with a lap and a half to go and took the White flag with about half the straightway gap from Sonny. Kept pushing hoping that something will happen, and it did. As I'm making my way towards Phil hill, I see a yellow flag, Sonny must've spun it, yes! He did, I squeezed by him going into Riverside and thought to myself that all I have to do is cruise it home with no mistakes. A missed shift right after bus stop and I got myself a race! It was soooooo hard to keep Sonny behind on well-done tires... came out of Sunrise completely sideways and barely ahead of Sonny who jumped to my side and drag raced to the finish. Got him by maybe 3-4 feet to take P4. Last session of the day I converted Creampuff back to a two seater and gave Patrick (GoDogGo) a ride. When track went cold we went on a track walk lead by Emilio who had many excellent pointers and tips dished out. One hell of a bonus for all Miata Challengers and SuperMiata drivers who joined the trip. BBQ couldn't be any better, good friends, good beer, good food, great help from Mei and Erik. Thanks MiataRoadster for co-sponsoring the MC BBQ with Blackbird Fabworx! First two sessions on Sunday morning I gave Sean (Lincoln Logs) and a Miata driver named Tammy rides in Creampuff, and then we got down to business with the split races, running inverted grid from yesterday on the first one and inverting again for the second one which we decided to do a standing start, yes! I got a bad start for the first race and just couldn't find the groove for a while. Dropped from P4 at the start to P6 and stayed there until the end. This put me in P2 for the standing start with Granturismo in P1. G couldn't find the tape line on pit wall that we decided to use as the P1 position marker (note: next time we should just tape a cone to the wall), so I made the terrible mistake of opening my visor to shout to him where the tape line is. Seconds before the Green flag dropped and I shut my visor back down, got a rocket start again and went straight to the lead but before we even hit Sunset my visor got so fogged up I could barely even see the track. Unable to see my mirrors and hardly even seeing the braking zone I went for a wide line to avoid getting collected by anyone and by the time I could see again I dropped down to P4. William ran in P3 and had just enough in his tires to keep me behind for 3 laps, then I got a slightly better run on him going into the front straight to take the White flag. Managed to outbrake him into Sunset, park him on the outside and immediately pulled a good F1 style blocking move on Aaron who was ready to capitalize on both of us as we parked. Aaron got by William, I pulled off the block well enough to keep him behind and cruised it home for P3. So much action and hot battles in 2 days. This was easily the most fun weekend I had at the track since we did the same format of MC / SPM in Chuckwalla. Spring mountain in two weeks, yeah! Last edited by Blackbird; 09-23-2013, 09:37 AM. Sunday races were fun to watch. I am ready to join anytime soon. ^^ If I understand SPM rules correctly, Bavarian vehicles are verboten. Are you Miata shopping? The SV site says "SV club race",so there may be other classes.See other thread about details. There are several cars for sale. I think Aaron Bitterman is going to buy Enzo, the red NB that Alex was driving. Alex has another car. I'm finishing a third NA that will be ready to go in about 3 weeks, also for sale. Sonny has Miller for sale. IronCanyonMotorsports.com in canyon Country has a few. SV's race group allows any race car. Non-SPM's get their own start wave. Kiril, you should just buy a Miata and race in class. I was there on Saturday, lots of action and fun to watch. Everyone looked like they were having a great time. Too bad I missed Sunday.